As I’ve learned Hebrew this year, I’ve had fun picking up on the various meanings of words that get lost when we translate the scriptures into our own language. One of my favorite words has been shamar. It means to keep, protect, preserve, watch, and guard. Often, the word is used to talk about how God takes care of humanity. Psalm 121 has the most beautiful expression of this idea in verses 5-8: “The LORD watches [shamar] over you— the LORD is your shade at your right hand; the sun will not harm you by day, nor the moon by night. The LORD will keep [shamar] you from all harm—he will watch [shamar] over your life; the LORD will watch [shamar] over your coming and going, both now and forevermore.” (TNIV). Another place this word shows up, which is appropriate for the events of this weekend, is in Genesis 2:15: “The Lord God took the man and put him in the Garden of Eden to work it and take care [shamar] of it.” (TNIV). In this part of the creation story, The Lord tells humanity to shamar the land – to watch over it, protect it, guard it, and keep it. How often we’ve gone wrong thinking our purpose was to dominate the earth God gave us, when instead we’re supposed to be good stewards of it! Tomorrow is “Earth Day” – a day when environmentally conscious people across our country will join in recognition of the fact that we need to take care of the planet that’s been given to us. How many Christian churches, however, will actually celebrate it as a day to care for God’s beautiful creation? I just finished watching Al Gore’s movie An Inconvenient Truth, and I can say that it is certainly worth your time to see. My friend John has some great reflections on eco-theology posted on his blog, which I would certainly recommend (most were published last August, in a five part series.) For some other reference sites, check out Allegheny Front, a local environmental radio show, and Ideal Bite, which has quick tips on practical things ordinary people can do. May God help us be faithful to shamar this beautiful world!! A review which I wrote of Peter Rollins’ book How (Not) To Speak of God has been posted at The PTS Logos. Check it out. Shameless Commercial Plug . 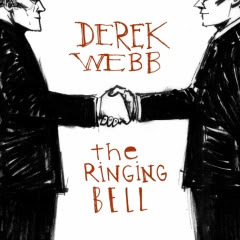 . .
Derek Webb has a new CD out and it’s fantastic. Check it out at www.theringingbell.com .